Data and big data analytics are fast becoming the lifeblood of any successful business. Getting the technology right can be challenging, but building the right team with the right skills to undertake big data initiatives can be even harder. Not surprisingly, that challenge is reflected in the rising demand for big data skills and certifications. 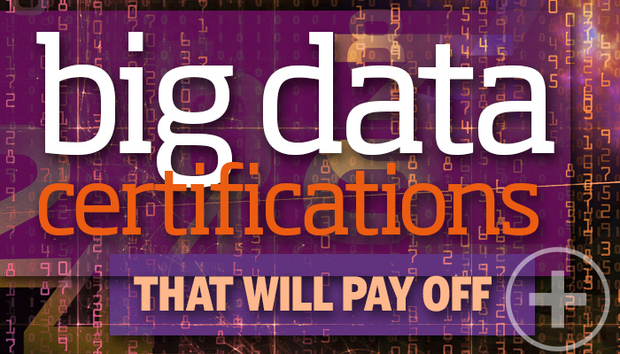 If you're looking for a way to get an edge, big data certification is a great option. Certifications measure your knowledge and skills against industry- and vendor-specific benchmarks to prove to employers that you have the right skillset. The number of big data certs is expanding rapidly. Below is our guide to the most sought after big data certifications to help you decide which cert is right for you. If you would like to submit a big data certification to this directory, please email us. Is big data certification worth pursuing? Organizations are on the hunt for data scientists and analysts with expertise in the techniques required to analyze big data. They also need big data systems architects to translate requirements into systems, data engineers to build data pipelines, developers who know their way around Hadoop clusters and other technologies, and systems administrators and managers to tie everything together. These skills are in high demand and are relatively rare. Individuals with the right mix of experience and skills can demand high salaries. The right certifications can help. "Advanced data analytics capabilities are just too critical for staying competitive," says David Foote, co-founder, chief analyst and chief research officer of Foote Partners. "They've expanded in popularity from a few industries to nearly every industry and market. And there is the Internet of Things, the next critical focus for data and analytics services. IDC is predicting a 30 percent CAGR over the next five years, while McKinsey is expecting IoT to have a $4 trillion to $11 trillion global economic impact by 2025 as businesses look to IoT technologies to provide more insight." While the market value of noncertified advanced analytics skills has actually increased faster as a percentage of base salary than the value of certified big data skills, according to Foote Research, Foote believes pay premiums for both noncertified and certified skills will steadily rise over the next 12 to 24 months. The Analytics: Optimizing Big Data Certificate is an undergraduate-level program intended for business, marketing and operations managers, data analyst and professionals, financial industry professionals, and small business owners. The program brings together statistics, analysis, and written and oral communications skills. It introduces students to the tools needed to analyze large datasets, covering topics including importing data into an analytics software package, exploratory graphical and data analysis, building analytics models, finding the best model to explore correlation among variables and more. How to prepare: A basic background in statistics and some prior college coursework is recommended. Offered in Hyderabad and Bengaluru, India, the Certificate in Engineering Excellence Big Data Analytics and Optimization is an intensive 18-week program that consists of 10 courses (lectures and labs) for students of all aspects of analytics, including working with big data using Hadoop. It focuses on R and Hadoop skills, as well as statistical modeling, data analytics, machine learning, text mining and optimization. Students are evaluated on a real-world capstone project and a series of quizzes. Price:₹3000 (INR) application fee and a program fee of ₹3,25,000 + 15 percent service tax. How to prepare: INSOFE admits students based on performance on its entrance exam and prior academic background and work experience. The Certification of Professional Achievement in Data Sciences is a non-degree program intended to develop facility with foundational data science skills. The program consists of four courses: Algorithms for Data Science (CS/IEOR), Probability & Statistics (STATS), Machine Learning for Data Science (CS), and Exploratory Data Analysis and Visualization (STATS). Price: $1,858 per credit (a minimum of 12 credits, including the four courses, are required to complete the program). In addition, there is an $85 non-refundable application fee for the on-campus program and $150 for the online program. The online program also includes an additional non-refundable technology fee of $395 per course. How to prepare: An undergraduate degree and prior quantitative and introductory to computer programming coursework are required. The Certified Analytics Professional (CAP) credential is a general analytics certification that certifies end-to-end understanding of the analytics process, from framing business and analytic problems to acquiring data, methodology, model building, deployment and model lifecycle management. It requires completion of the CAP exam and adherence to the CAP Code of Ethics. Price: $495 if you are an INFORMS member, or $695 if you're not. Team pricing is available for organizations. How to prepare: A list of study courses and a series of webinars are available through registration. The credential requires passing the remote-proctored CCA Administrator Exam (CCA131), which consists of eight to 12 performance-based, hands-on tasks on a pre-configured Cloudera Enterprise cluster. Each question requires the candidate to solve a particular scenario. Some require making configuration and service changes via Cloudera Manager, while others demand knowledge of command line Hadoop utilities and basic competence with the Linux environment. Candidates have 120 minutes to complete the exam. How to prepare: There are no prerequisites required, but Cloudera says the exam follows the same objectives as the Cloudera Administrator Training, making it excellent preparation for the exam. A SQL developer who earns the CCA Data Analyst certification demonstrates core analyst skills to load, transform and model Hadoop data to define relationships and extract meaningful results from the raw output. It requires passing the CCA Data Analyst Exam (CCA159), a remote-proctored set of eight to 12 performance-based, hands-on tasks on a CDH 5 cluster. Candidates have 120 minutes to implement a technical solution for each task. They must analyze the problem and arrive at an optimal approach in the time allowed. How to prepare: Cloudera recommends candidates take the Cloudera Data Analyst Training course, which has the same objectives as the exam. The CCA Spark and Hadoop Developer credential certifies a professional has proven their core skills to ingest, transform and process data using Apache Spark and core Cloudera enterprise tools. It requires passing the remote-proctored CCA Spark and Hadoop Developer Exam (CCA175), which consists of eight to 12 performance-based, hands-on tasks on a Cloudera Enterprise cluster. Each question requires the candidate to solve a particular scenario. Some cases may require a tool such as Impala or Hive, others may require coding. Candidates have 120 minutes to complete the exam. How to prepare: There are no prerequisites required, but Cloudera says the exam follows the same objectives as the Cloudera Developer Training for Spark and Hadoop course, making it excellent preparation for the exam. The CCP: Data Engineer credential certifies the ability to perform core competencies required to ingest, transform, store and analyze data in Cloudera's CDH environment. It requires passing the remote-proctored CCP: Data Engineer Exam (DE575), a hands-on, practical exam in which each user is given five to eight customer problems each with a unique, large data set, a CDH cluster and four hours. For each problem, the candidate must implement a technical solution with a high degree of precision that meets all the requirements. How to prepare: Cloudera suggests professionals seeking this certification have hands-on experience in the field and take the Cloudera Developer Training for Spark and Hadoop course. The EMCDSA certification demonstrates an individual's ability to participate and contribute as a data science team member on big data projects. It includes deploying the data analytics lifecycle, reframing a business challenge as an analytics challenge, applying analytic techniques and tools to analyze big data and create statistical models, selecting the appropriate data visualizations and more. How to prepare: EMC offers a training course, available as either a video or an instructor-led course. Designed for data architects, the IBM Certified Data Architect – Big Data certification requires passing a test that consists of five sections containing a total of 55 multiple-choice questions. It demonstrates a data architect can work closely with customers and solutions architects to translate customers' business requirements into a big data solution. How to prepare: IBM recommends a series of seven multi-day courses on SPSS Modeler to InfoSphere BigInsights to prepare for the test. The IBM Certified Data Engineer – Big Data certification is intended for big data engineers, who work directly with data architects and hands-on developers to convert an architect's big data vision into reality. Data engineers understand how to apply technologies to solve big data problems and have the ability to build large-scale data processing systems for the enterprise. They develop, maintain, test and evaluate big data solutions within organizations, providing architects with input on needed hardware and software. This certification requires passing a test that consists of five sections containing a total of 53 multiple-choice questions. How to prepare: IBM recommends a series of nine multi-day courses to prepare for the test. The MCSE: Data Management and Analytics credential demonstrates broad skill sets in SQL administration, building enterprise-scale data solutions, and leveraging business intelligence (BI) data in both on-premises and cloud environments. To earn the certification, candidates must pass one of 12 exams. How to prepare: To pursue this credential, you must first earn one of seven Microsoft Certified Solutions Associate (MSCA) Certifications: MSCA SQL Server 2012/2014; MCSA: SQL 2016 Database Administration; MCSA: SQL 2016 Database Development; MCSA: SQL 2016 BI Development; MCSA Machine Learning; MCSA: BI Reporting; or MCSA: Data Engineering with Azure. Additionally, Microsoft offers preparation tools for each of the 12 exams that lead to the MCSE: Data Management and Analytics certification. Designed for software engineers, statisticians, predictive modelers, market researchers, analytics professionals, and data miners, the Mining Massive Data Sets Graduate Certificate requires four courses and demonstrates mastery of efficient, powerful techniques and algorithms for extracting information from large datasets like the Web, social network graphs and large document repositories. The certificate usually takes one to two years to complete. How to prepare: A Bachelor's degree with an undergraduate GPA of 3.0 or better is required. Applicants should have knowledge of basic computer science principles and skills, at a level sufficient to write a reasonably non-trivial computer program. The MongoDB Certified DBA Associate credential is intended to demonstrate that operations professionals understand the concepts and mechanics required to administrate MongoDB. It requires a 90 minute, multiple choice exam. How to prepare: There are no prerequisites, but MongoDB suggests candidates complete an in-person training or one of its online courses (M102: MongoDB for DBAs; M202: MongoDB Advanced Deployment Operations). MongoDB also provides the MongoDB Certification Exam Study Guide, available to those who have registered for a certification exam. The MongoDB Certified Developer Associate credential is intended for software engineers who want to demonstrate a solid understanding of the fundamentals of designing and building applications using MongoDB. It requires a 90 minute, multiple choice exam. How to prepare: There are no prerequisites, but MongoDB suggests candidates complete an in-person training or one of its online courses (M101J: MongoDB for Java Developers; M101JS: MongoDB for Node.js Developers; M101N: MongoDB for .NET Developers; M101P: MongoDB for Developers). MongoDB also provides the MongoDB Certification Exam Study Guide, available to those who have registered for a certification exam. The Oracle Business Intelligence Foundation Suite 11 Certified Implementation Specialist certification demonstrates skills in implementing solutions based on Oracle Business Intelligence Suite. It covers installing Oracle Business Intelligence Enterprise Edition (OBIEE), building the BI Server metadata repository, building BI dashboards, constructing ad hoc queries, defining security settings, and configuring and managing cache files. The certification is intended for intermediate-level implementation team members with up-to-date training and field experience. Earning the certification requires passing the Oracle Business Intelligence (OBI) Foundation Suite 11g Essentials exam (1Z0-591). It's a multiple choice exam that consists of 75 questions. Candidates have 120 minutes to complete the exam. How to prepare: Oracle recommends candidates complete one of two training courses: Oracle Business Intelligence Enterprise Edition Plus Implementation Boot Camp (only available to partners), or Oracle Business Intelligence Foundation 11g Implementation Specialist. The SAS Certified Big Data Professional certification program is for individuals seeking to build on their basic programming knowledge by learning how to gather and analyze big data in SAS. The program focuses on SAS programming skills; accessing, transforming and manipulating data; improving data quality for reporting and analytics; fundamentals of statistics and analytics; working with Hadoop, Hive, Pig and SAS; and exploring and visualizing data. The program includes two certification exams, both of which the participants must pass. How to prepare: At least six months of programming experience in SAS or another programming language is required to enroll. How to prepare: SAS recommends candidates prepare using its SAS Data Science curriculum from SAS Academy for Data Science. It costs $4,400 for a self-paced e-Learning course, or $16,000 for a six-week instructor-led course in Cary, N.C. Geared at strategy managers, scientific researchers, social sciences researchers, data analysts and consultants, and advertising and marketing executives, the certificate requires candidates complete three courses, starting with either Data Mining and Analysis or Introduction to Statistical Learning. The first course must be completed with a B+ or better and the other courses must be completed with a B or better to earn the certificate award. It takes an average of one to two years to complete the certificate. How to prepare: To pursue the graduate certificate, candidates must have taken introductory courses in statistics or probability, linear algebra, and computer programming. The candidate also requires a conferred Bachelor's degree with an undergraduate GPA of 3.5 or better. What will nano-satellites for communications bring to Latin America? AI and gender bias - who watches the watchers? Transparent vs. Opaque AI: Which is right for you? Is Artificial Intelligence helping or hindering IT defenders? Is the cloud the key to democratizing AI?